Summer Reading 2018. The Library Rocks! "So funny and so well received. We had compliments galore and cannot wait to have Professor Whizzpop back next year! "- Sally Baron. Youth Services Coordinator. Wake County Libraries. "Thank you for making us laugh & doubt our eyes. I hope to long remember the girl sitting in the back of the cluster of kids on the floor who laughed so much & so hard that she literally fell back, rolling around, & almost turned completely over. "- Margaret Adam. Youth Services Coordinator. Forsyth County NC. During the show we'll travel at the speed of sound, defeat an alien invasion, learn about black holes and encourage the audience to explore a universe of books! We will rocket into reading with Stephen and Lucy Hawking's "George", spin through the solar system with Fly Guy and take one giant leap into your library! Roll Up! Roll Up! For the Greatest Show on Earth! 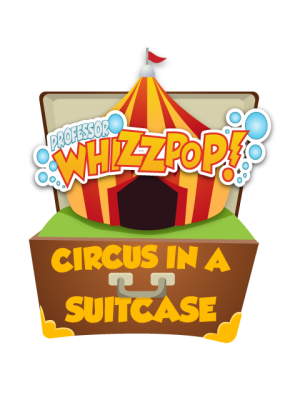 Professor Whizzpop's 2019 Summer Reading Program: The Circus in a Suitcase! It's a one man variety show guaranteed to amaze, amuse, enthrall and enthuse your library audiences! We'll "Run the Circus" with Dr. Seuss, perform a death defying stunt and bring books to life with the one and only Barnum! Reserve your seats today here or call 828 506 3198.